One of the meet’s best innovations has been having jockeys sign autographs and pose for photos on Thursday mornings at breakfast on the Clubhouse Porch. Considering the good that the program serves all people involved, you would hope that NYRA could figure out how to get it in an extra day or two a week. 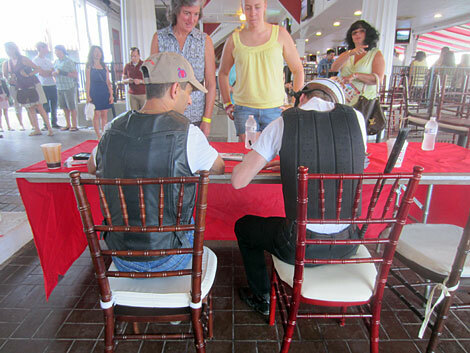 Jockeys John R. Velazquez and Julien Leparoux signing autographs at breakfast. A jockey is a celebrity in these parts. Edgar Prado, Javier Castellano and Irad Ortiz, Jr. participated in the new breakfast program earlier this meet. Velazquez is legendary for engaging the public. 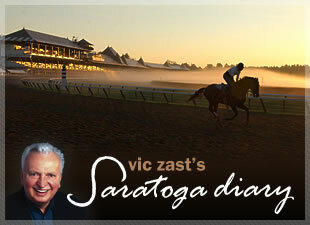 Wait until Friday morning when the Museum of Racing inducts him into the Hall of Fame. The walls of Fasig-Tipton’s Humphrey S. Finney pavilion will come down in a torrent of applause. On Monday evening, Velazquez and a dozen jockeys will perform karaoke at the Vapor Night Club to raise money for the Permanently Disabled Jockeys Fund. If journeyman jockey Dean Mernagh comes to lend his support, as he has in the previous two years, guests will hear a rendition of “New York, New York” that’s the equal of Sinatra’s. New York, New York is a recurring theme. The Fasig-Tipton barns are filling up with New York-bred yearlings for the upcoming auction. “We’ve got 18 to sell,” said Craig Bandoroff of Denali Stud, whose outfit sold the second highest priced horse at the first night of the recently-concluded Selected Sale. Another New York Stallion Series stakes, called the Statue of Liberty, was run. A lot of horseplayers expected that I Bet Toni Knows, a 3-year-old bay filly by Sunriver that had won three of her six career starts, would win. But she reared in the gate and hurt herself and became a last second scratch. My Jopia gave jockey Ramon Dominguez his fourth winner on the card in a four-horse photo. The irrepressible Wilmer Garcia struck again with a longshot. Somebody had better start taking him seriously and begin to give him good horses to ride. The bug boy piloted the 29-1 shot Warrior Up to victory in the 10th race. With a $40 wager on Warrior Up, Emad Himaya of Lindenhurst, NY jumped into the lead and captured the $100,000 grand prize in the “Battle of Saratoga” handicapping contest─lots of moolah for picking horses. New York was passed over as a host for the 2013 Breeders’ Cup World Championships. But it’s only a matter of time before New York Racing Association stops giving the selection committee excuses for not placing the event at Belmont Park. Horsemen have made 106 claims during the meet. The casino revenue-enhanced purses are driving the frenzy.